Blog2Social - Schedule post to social media like Facebook, Auto-post to Facebook, share blog posts to Facebook, Twitter, LinkedIn, google+, Instagram, PinterestHow do I auto-post and auto-schedule blog posts on social media with the Social Media Auto-Poster? The Auto-Posting feature lets you automatically share your post immediately when you publish your post. 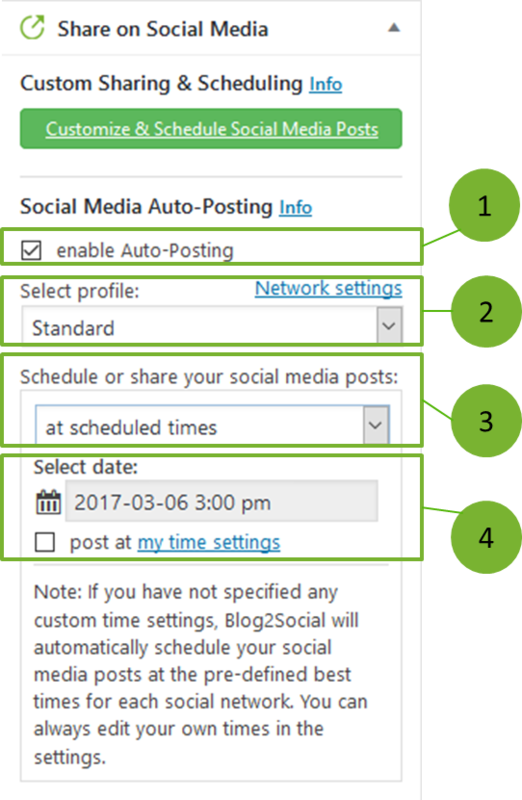 Or, you can schedule your social media posts for a specific date and use your personal best time settings for each network. You can also use the Blog2Social Auto-Poster for your scheduled blog posts. If you select "immediately after publishing" the social media posts will be shared as soon as your post is published on your blog. If you select “at scheduled times” your posts will be shared with your scheduled date and times. Click "publish" in your WordPress post editor. You can use the Auto-Poster for scheduled blog posts as well. 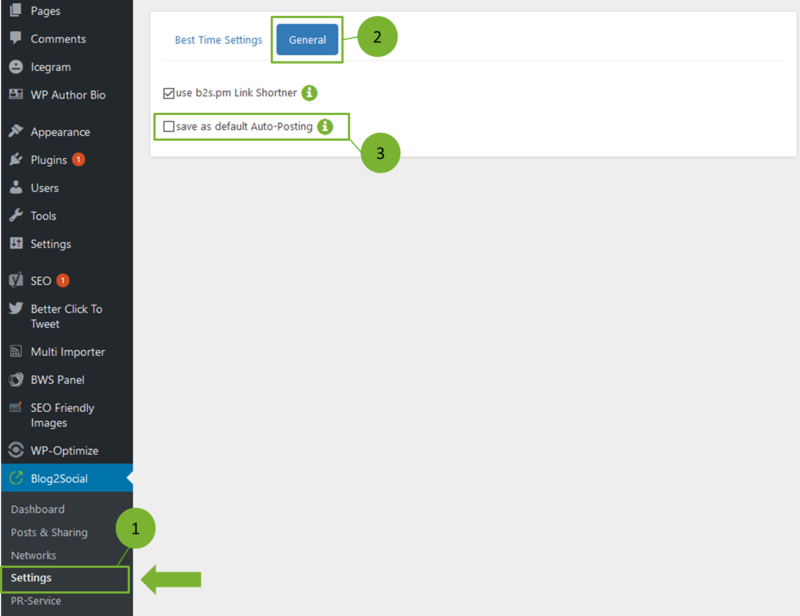 Follow the steps described before and click "schedule" in your WordPress post editor. Blog2Social will share your post as soon as it's published. Adjust the posting date and time. Alternatively you can check "post at my time settings" to use your individually adjusted preferred times to post. If you schedule for the same day Blog2Social will look up whether the best times are already passed for the day and automatically schedule for the day after that day. 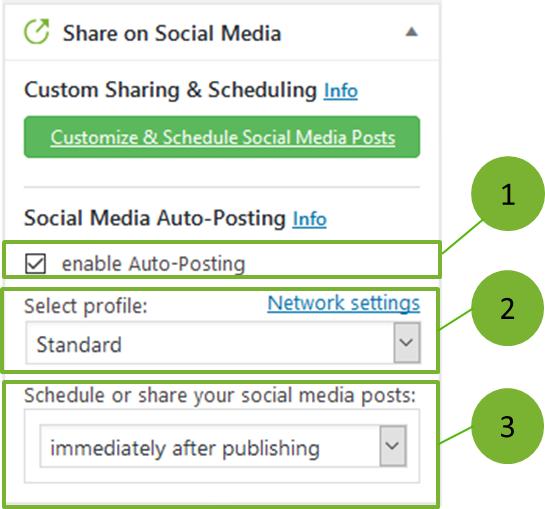 To schedule your social media posts for scheduled blog posts, just follow the same steps. Blog2Social will share your post at the scheduled time after the blog post is published. You can activate auto-posting as default option in Blog2Social. Tick the box "save as default Auto-Posting"